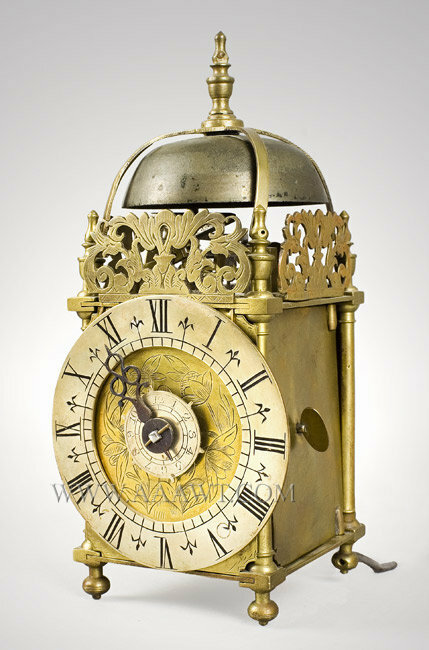 Haggar and Miller, Suffolk Clocks and Clockmakers, reported that no Griffin or Giffin lantern clocks are known to be extant; by the late 1750s the demand for this type of clock had waned in favor of longcase clocks. This is likely the only example extant. Posted by David Addy: “I received emails from Marc Honcoop containing pictures of a clock which he owns. "I live in the Netherlands. 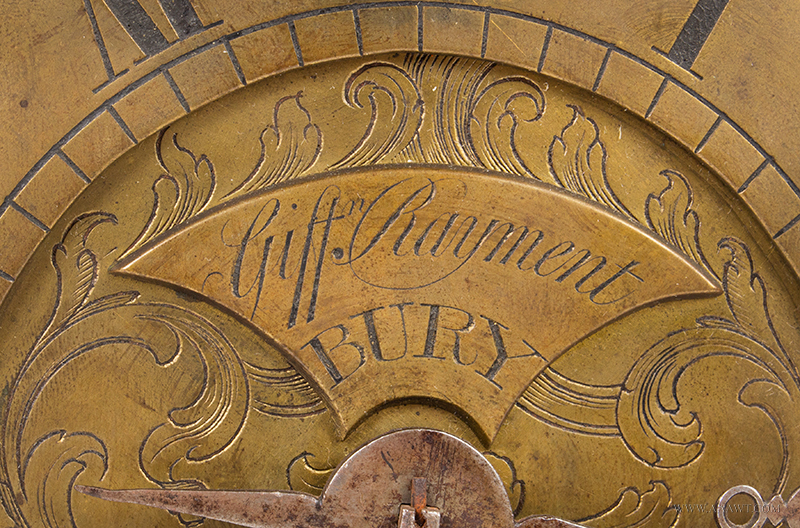 I have a Lantern clock of Giffin Rayment. This is the only one he made.... The clock is all original with no signs of restoration. The clock was bought about 40 years ago for fl.15,000 gulden. That was a lot of money for those years. I don't know the date the clock was made.” Possibly Rayment made the clock with his father about 1730-1740, but I think the clock is younger at about 1760." Giffin Rayment died in January 1769, and he was buried at St James's church on January 24th. His widow Esther was granted Administration as he had not yet made a will, being only 47 years old. Eight day, time only, original movement and dial and weight, old finish, running. 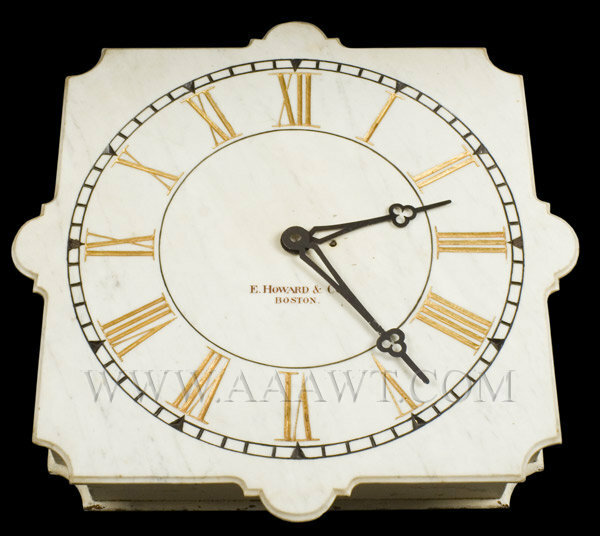 The case with shaped crest and original brass eagle finial over the upper Eglomise panel inscribed "Aaron Willard/Boston" within elliptical reserve; in front of the dished dial having a white painted face is the original Eglomise plate decorated with American shields and oak leaf motif. The lower case with central mirrored medallion is said to have been enameled black by a family mourning the death of Robert Gould Shaw in 1863. 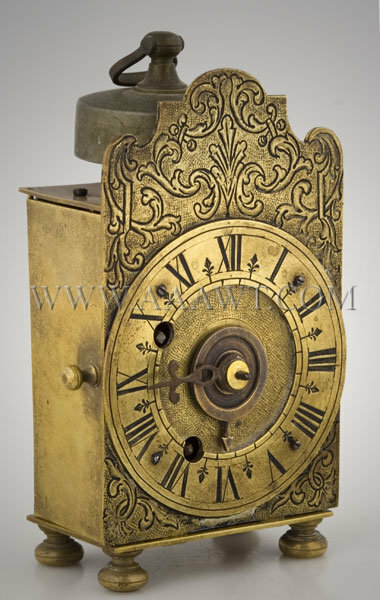 The case containing a weight driven, brass eight-day movement is often referred to as a "dish dial" shelf clock. 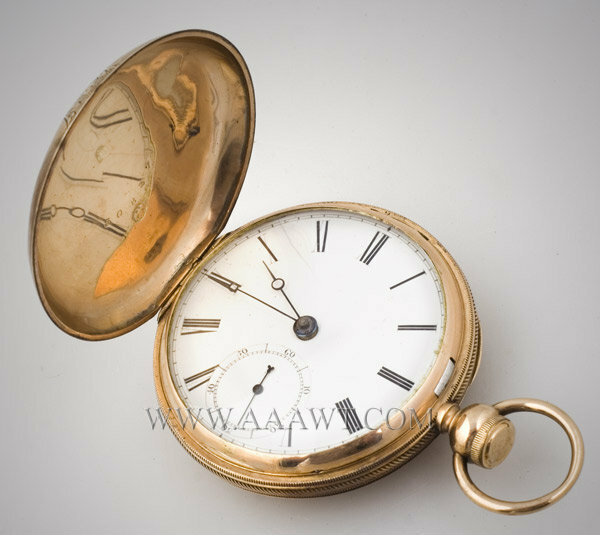 The case, made of the best mahogany, retains its original surface with a rich, warm patina; and continues to a cushion molded base resting on turned brass feet. The case is die stamped on the dust board “619", a very identifiable detail commonly found in Boston timepieces whose cases were made by Henry Willard, Aaron Willard Juniors brother-who worked within the Willard clock-making compound at Boston. We have other information related to purported provenance which at this time is supposition. Please call for additional information. 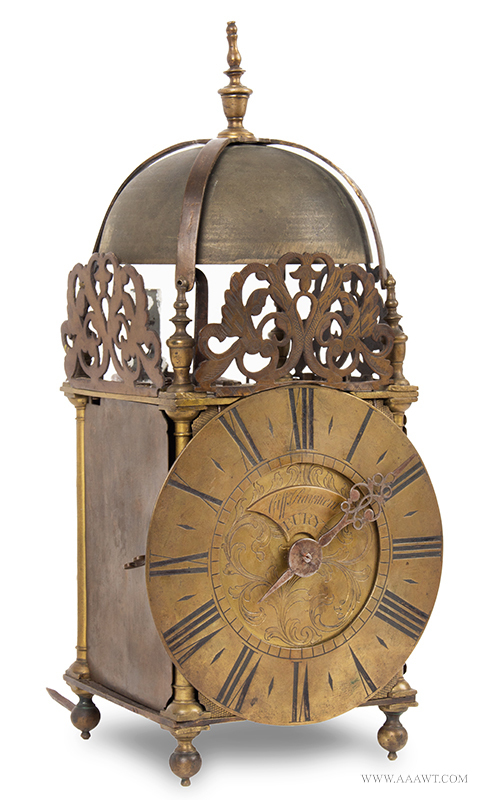 Dunning (1795-1841) was born in Brunswick, Maine, he began his career in Concord, Massachusetts in partnership with Lemuel Curtis, where they produced many fine clocks. The pair moved to Burlington, Vermont in 1821, where Dunning continued his career after the partnership dissolved in 1832. The R. & J.B. Terry partnership was short-lived; they were in business for two years. This example, a true triple-decker features a carved and gilt eagle pediment above the pierced dial-aperture glazed with silvered mirror glass. 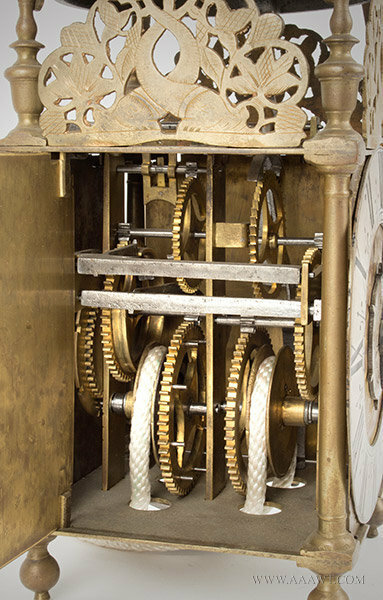 The dial, with Arabic numerals has been restored; restoration to chapter ring and dial center. The mahogany veneered case, in three sections is flanked by ebonized and gilt columns; top and bottom turned and split; the middle section features full tapered columns. The glasses are original; some in-painting; seen through the scalloped roundel in middle section is a reverse painting on glass, depicted is Andrew Jackson. The case is raised on slightly protruding base resting on gilt ball feet. Minor imperfections include some paint and gilding restoration. 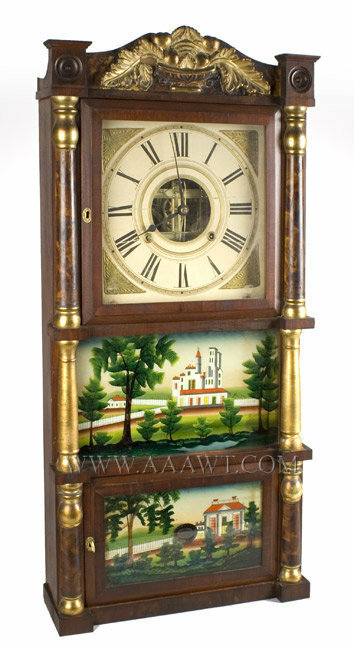 This attractive clock which measures 37 by 17 by 5 1/8" is in running condition. 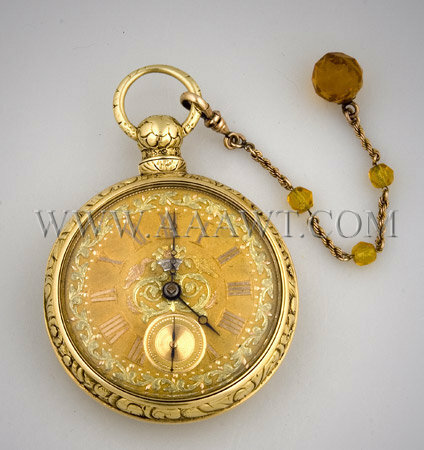 Original glasses and putty, faux smoked decoration, retains good label A mahogany containing 30-hour movement; case with carved gesso and gilded fruit basket splat, turned, gilded and smoke grained columns flanking the painted wooden dial with Roman numerals features gilt spandrels and open dial center displaying strap movement. 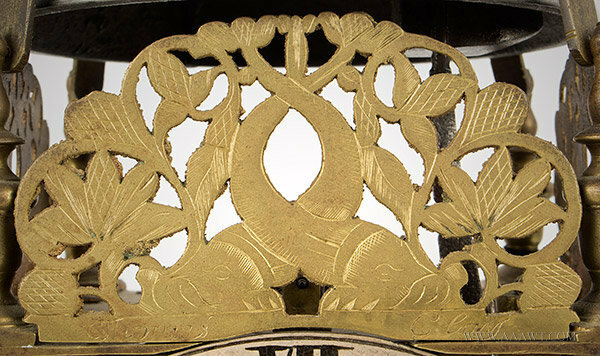 The dial section surmounted by a carved, gesso and gilt fruit basket; centered by faux grained half columns with gilded capitals. The mid-section features an outstanding reverse-painted tablet flanked by free standing gilt columns, lower section with faux smoked half columns and door framing the excellent reverse-painted tablet. The printed maker's label remains intact. The carved and gesso pediment with shrinkage cracks; dial with shrinkage fissures; lower glass tablet cracked at upper-right; missing ball feet. All else fine. 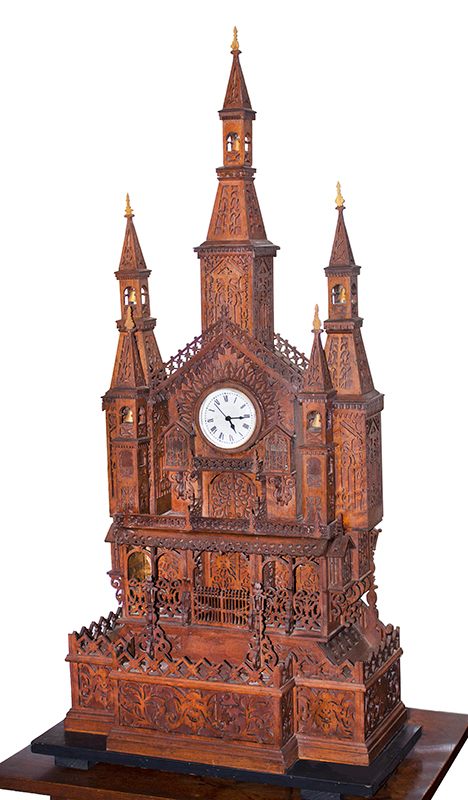 A rare 30-hour painted iron front clock; the iron front has cast into the back "No. 1 F. S. Otis Patent. N.Y., 1857". 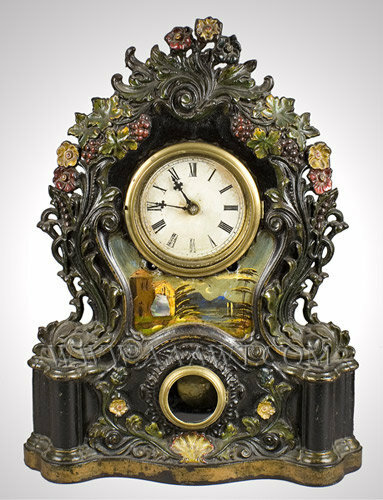 The front features a painted landscape scene, pearl inlay, and painted cast iron grape leaves, scrolling, shells and flowers. 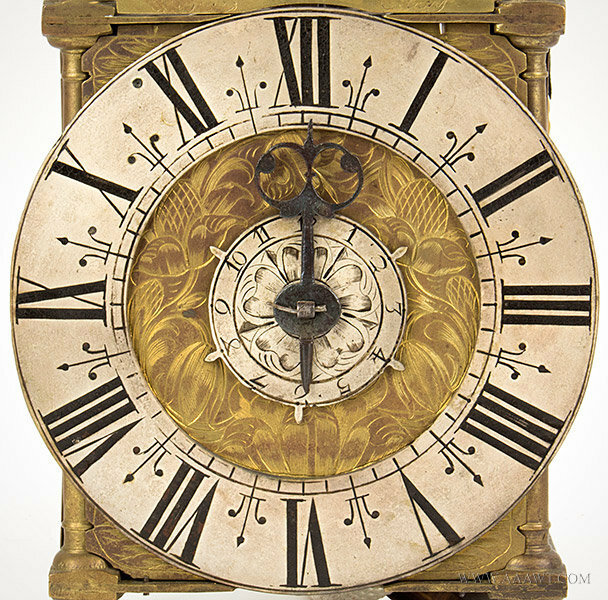 The paper dial with Roman numerals displays some staining and thinning paint; 1859 patent bezel is fine. Movement mounted to backboard. 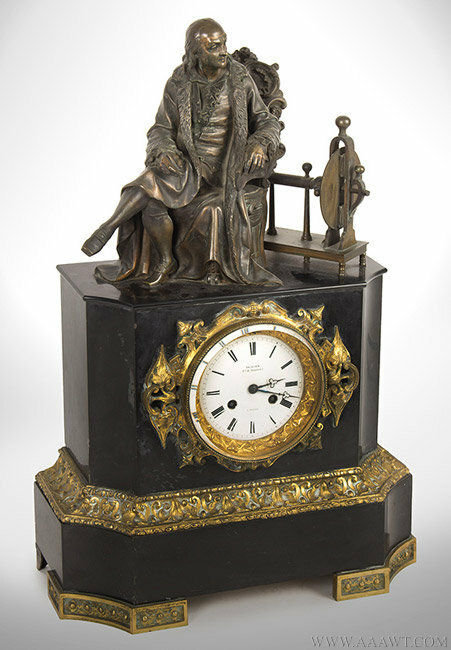 Seated figure of Franklin with scientific apparatus surmounting base inset with enameled dial and gilt brass mounts; the dial signed Mercier. 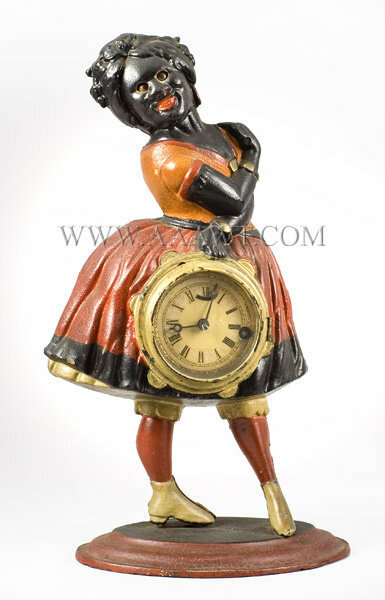 The cast iron case in the form of a black woman; thirty-hour lever escapement, paper dial; mechanical drive providing automaton motion to the eyes which move up and down following the action of escapement. Old repaint now with dry patina; clock doesn't run; screw missing from left boot; ready and worthy of restoration. This example surmounted by a large bell atop which is a tall and elegant finial...above the pierced and engraved dolphin and floral frets cornered by sophisticated finials. Centering the engraved, enameled and silvered chapter ring that is somewhat wider than its earlier cousins is the dial center with full coverage engraving being of leafy Rocco design. The chapter ring is signed either side of the numeral VI-Will Risbridger-Dorking. 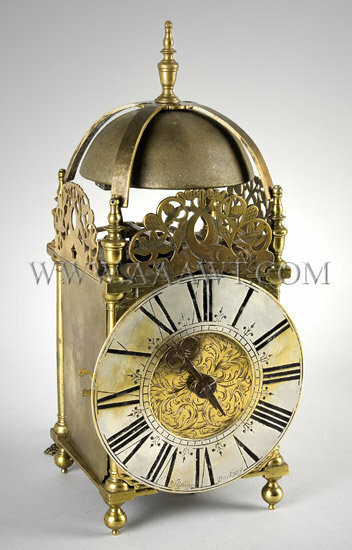 This mechanically fine clock is raised on robust feet and stands at 15.25". 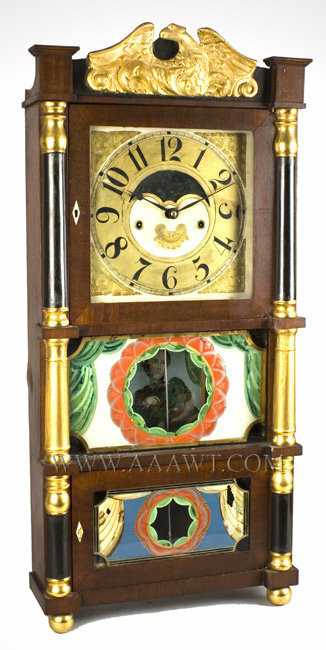 For futher information about this clock and others, contact David Hillier at drh@aaawt.com. 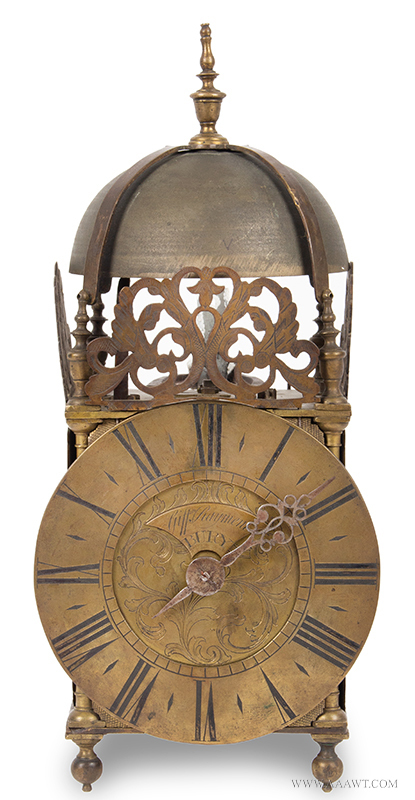 This attractive banjo clock features a rare alarm movement with outside bell mounted at the crest. The frames each contain magnificent original painted glass tablets in exceptional condition. The throat glass is exceptional with outstanding and important foliate and scroll motif with fanciful flourishes above a basket of fruit and the word "patent: within a scroll festooned with Rocco style decoration...the red, gold, blue and sepia decoration is all the more forceful against the mustard ground. The lower glass is decorated with the deity Aurora driving a team of winged horses, within a gilt border against the conforming mustard ground. Note the definition of Aurora's face and the incredible detail of the chariot as related to color and fancy ornamentation. The chariot is positioned before a powerful explosion of light rays and roiling clouds as it floats on ethereal clouds that ground the composition. The movement is signed with a die stamp at the upper right on the front plate "A. Willard Jr / Boston". Very few movements are signed. The case retains a dry surface with fine old patina. 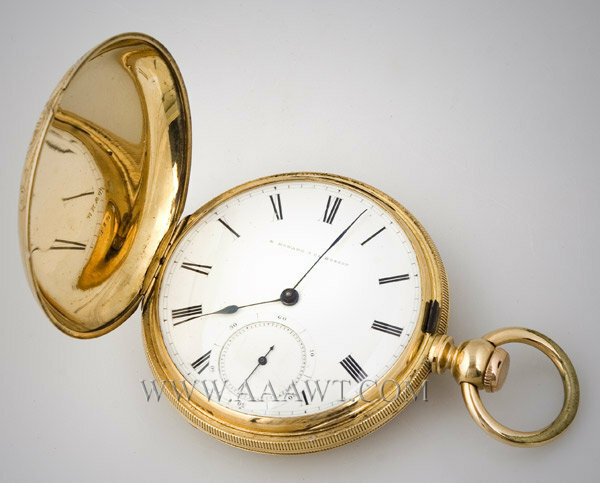 Height Overall 32 1/8"
The original brass movement has been serviced and is in good running order. The alarm mechanism has been expertly restored. The alarm hand and weight are replaced with exact copies from original examples. The bell is period but not original to this clock. The original dial has restoration to the infield. This small British timepiece with arch dial and applied Rocco spandrels centered by a silvered disk engraved with makers name within the arch. The face, also with lovely cast Rocco spandrels surrounding the engraved and enameled chapter ring that frames the dial center which is decorated by a double quietly elegant trailing vines and foliate engraving in the center of which is the alarm setting disk. 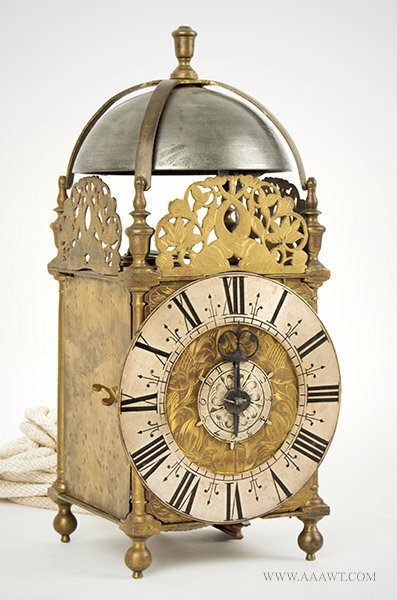 This clock is sold with a hanging shelf of undetermined age; for display and use as depicted. Mechanically fine and having a height of 8.5". 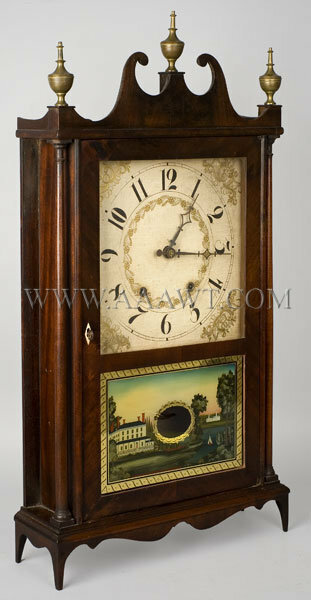 For futher information about this clock and others, contact David Hillier at drh@aaawt.com. 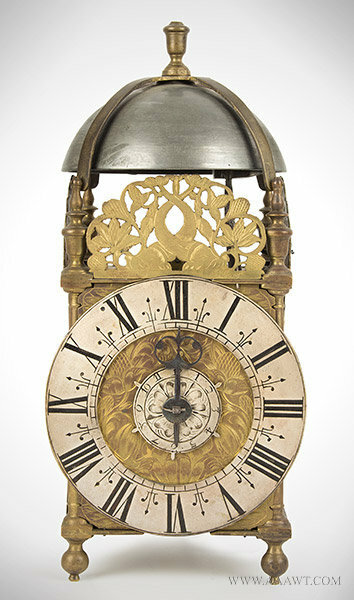 As depicted, an elegant shelf clock, the dial with raised gilt spandrels; raised gilt ornamentation within chapter ring. 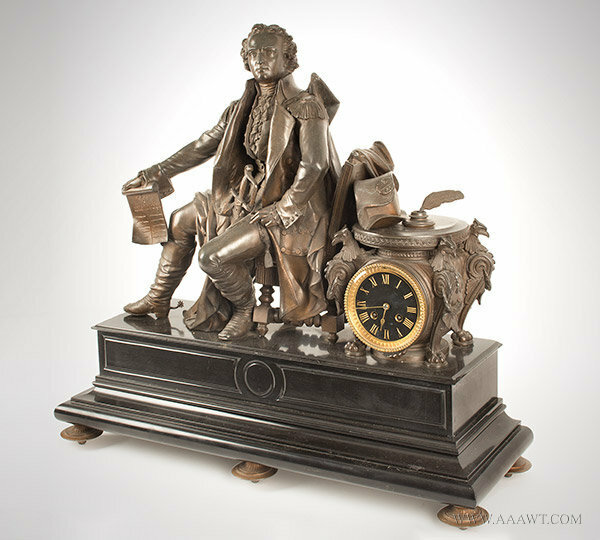 This attractive time piece has typical restoration including feet, reverse painted tablet, and other minor imperfections. Dimensions: 31.25" high, 17.25" wide, 4.5" deep.